The purpose and mission of the Campus Care and Support Team (CCaST) is maintaining a safe, optimum learning and working environment for the HCC Community with care and support. 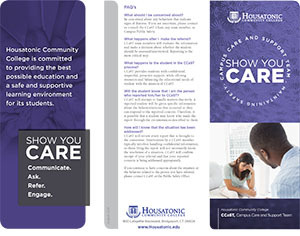 Housatonic’s Campus Care and Support Team (CCaST), was established in compliance with the Connecticut State Legislation Mandate of January 2014, PA-13-3 Sec. 92. As an important member of the college community, you have a responsibility to support the efforts of CCaST in keeping our campus safe for learning and working. The best way you can help is to either refer or report any behaviors of concern that you may have experienced, witnessed, or observed. Report because you care! To make a referral, please send an email to: . If you feel there is an immediate threat to self or others, call HCC Public Safety at 203 332-5025. For A Few Examples of Potential Behaviors of Concern, please click here.